The natural world a fast escaping thing. Urbanisation, digitisationâ¦ every step into invention takes us that bit further away from our roots. And yet we can't do without it. Nature still retains a strong hold over us  physically, emotionally, and in our imagination. 60% Water brings together three English painters who each explore this in a different way: Sarah Harvey, Jon Braley & Alexander Heaton. 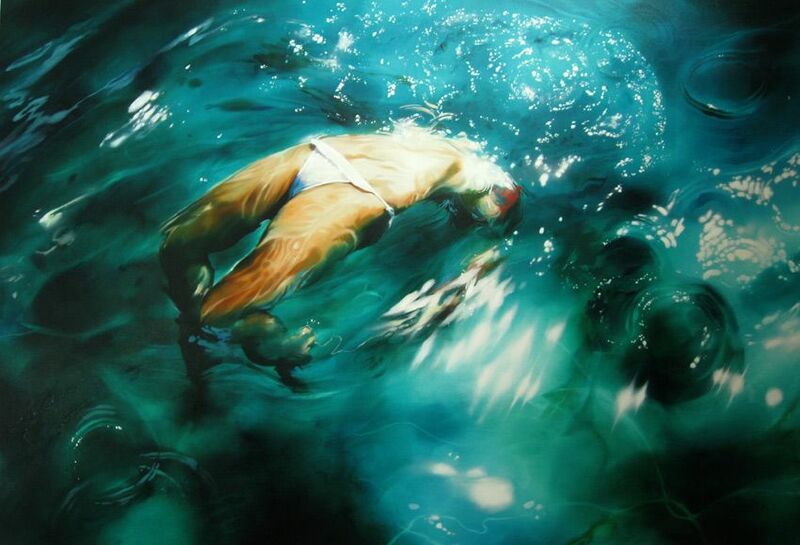 Sarah Harvey's paintings deal with two very basic elements: water, and the body. With these two ingredients, Sarah conjures up all the sensuality, freshness and fascination that bodies of water instinctively inspire. She has an uncanny ability to capture the way light reflects through liquid, and how the submerged human figure abstracts down into whirls, swirls and shards of light. Sensuous, engaging and emotionally charged, Sarah's paintings address some of our most basic visual instincts. Jon Braley's work is about how we imagine the wilderness, and our sense of separation from it. Ostensibly based on landscapes, his abstract resin paintings have a liquid quality, where the colours bleed into each other over several layers like the slow process of sedimentation of an estuary captured in amber. And yet their finish is slick, plastic, as if containing the idea of unspoilt nature as a packaged product. The pull between these two forces  the sublime and the manufactured  lend Jon's work an uncanny Romantic power. Alexander Heaton's paintings are based on his experiences as a mountain climber, travelling to some of the most remote and unvisited places on the planet. His work starts with almost photographic depictions of hard-to-reach places, and then ventures into the mythical associations that have grown up around them. Partly a matter of the sublime, Alex's work is also about the point where, by leaving civilisation behind, the imagination starts to take charge, delving deep into the subconscious of old myth and folklore to animate the natural world with stories and spiritualism.